all day from 10 o'clock. All ages welcome to come and have a go, bbq and drinks available at the ground or at the Colibri bar in the town or at the Snack by the campsite. It's free, we provide all the gear. See you there! We are organising our annual open day on Saturday the 12th of September. will have nets for the adults and finish with a match for everybody. friends and neighbours, and their kids. We have been having technical problems with this site recently, that's why there have been no updates this year! However we regularly post news on our Facebook pages, in French here and in English here. 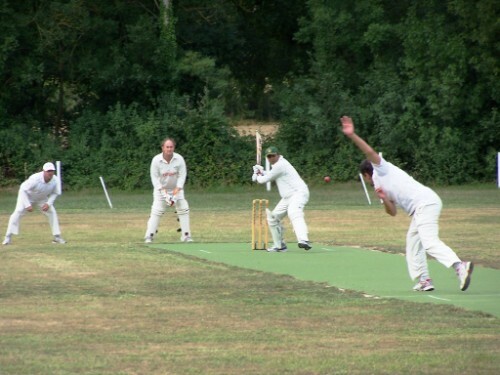 And have a look at Phil's Blog for a players-eye view of cricket in France. We are alive and well, two victories in the league in 2015! 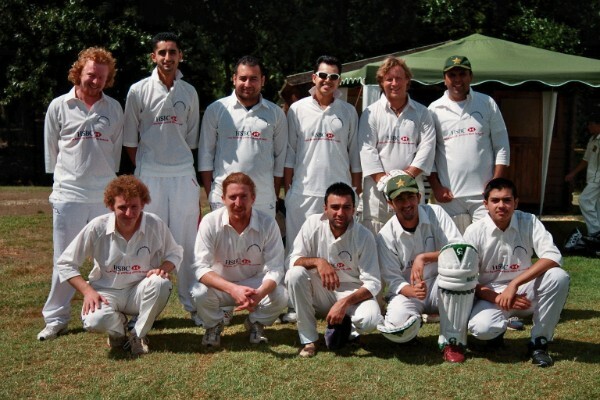 This Sunday the 14th of September we are organising our first Six-a-side cricket tournament. We have tried out the format at training, 5 teams are coming- St. Aulaye (24) Poitiers (86) Le Creusois (23) Amgoulême and Mansle. They will play four matches each in a round-robin, then two semi-finals and the final. Start time is 10 o'clock sharp, finish around six-ish, there will be drinks available on the day. We are organising our annual open day on Sunday the 7th of September. The morning session is mostly for youngsters, and in the afternoon we will have nets for the adults and finish with a match for everybody. Of course it's free, we provide all the gear, bring your picnic, and the sun tan cream! Cricket... alive and kicking here in France. An article by Paul Allan in the "English Spoken" Newsletter. When I left England in 2007 to start a new life in France, I thought that I could say cheerio to my assorted cricket equipment, helmets, pads, bats and the like. who play an occasional game against touring sides, to full blown leagues playing league and cup matches on a more or less weekly basis. On top of that, there are winter tournaments playing 6 a side games in gyms dotted around the country. I first heard about the chance of playing a couple of years ago when I saw an ad for a team based near to Poitiers. I subsequently joined and played a few games. 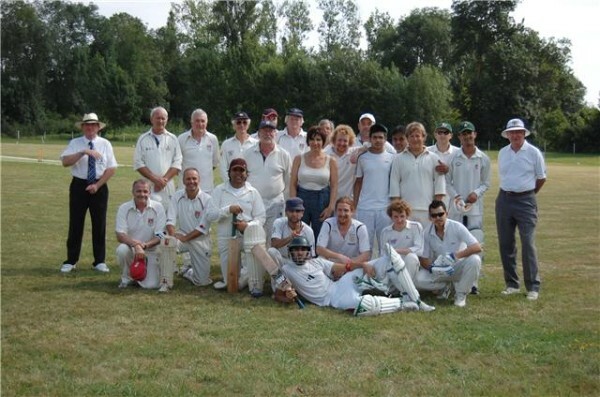 Unfortunately this team folded, but by chance we had played at Mansle in the Charente which was even nearer. I am now in possession of the fine kit sported by Mansle Cricket Club. The only downside to playing is the travelling to away games such as Bordeaux which is a 6 hours round trip. The upside is that we played there in the grounds of a magnificent wine chateaux with a taste of the local tipple after the match! The league is surprisingly competitive with some excellent players who would grace a lot of very good standard teams back in the UK. 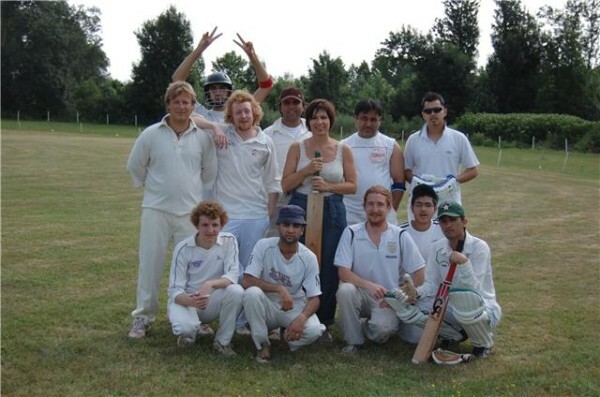 The teams are usually made up of expats, asian players along with French born younger players of British, Irish, Australian or Pakistani extraction. 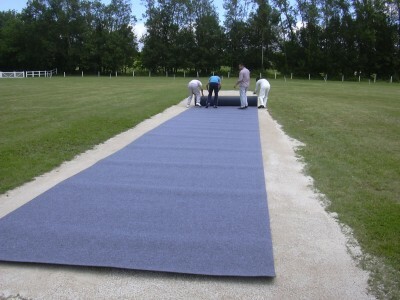 With the exception of a very small number of teams,(Saumur comes to mind), the wickets are artificial, such as ones that we used to see at schools in the UK. 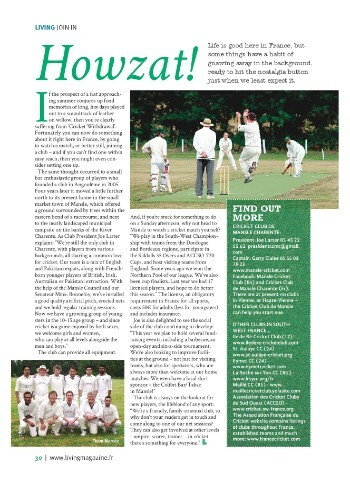 So if you played cricket back in the UK, why not have a look on the internet and see if there is a team near to you? 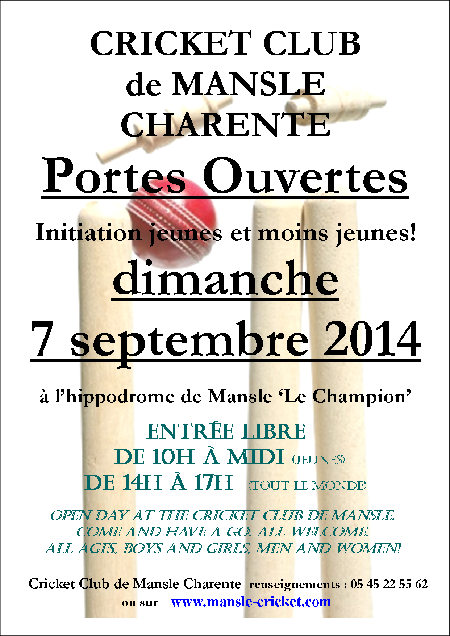 If you are within any driving distance of my team Mansle in Charente, then please contact me on 05 49 97 02 91. You will be made very welcome and please bring the family. 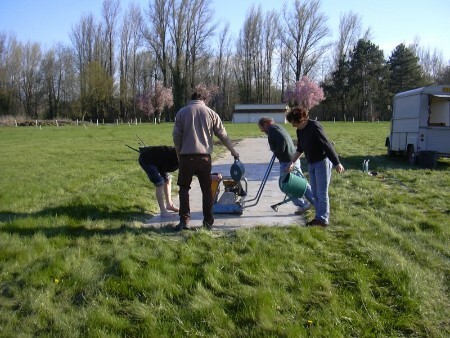 The pitch is in a picturesque setting by the River Charente with a childrens play area and a short walk into the town. St Aulaye’s batsmen started well scoring at 6 an over, helped by some wayward bowling which provided many extras. St Aulaye were also assisted by at least 4 dropped catches! Their top scorers were Daniel Nott 36, Mian 45, David Bordes 51*, extras 56! 240 for 7 off 40 overs. Best bowling for us- Ajmal 3 for 39 off 8 and Steve 2 for 13 off 3. We got off to a good start, but Ajmal was adjudged lbw for 15, Steve was caught behind off the same bowler, Danial ( 4 for 10 off 6) for 0, Paul cut one back onto his stumps for 5 and Garry was caught at short mid-on for 3, then Tom was run-out before facing a ball- from 19 for 1 in the 6th to 29 for 5 in the 13th over! The Larter boys stayed in a while but didn't manage to score much off the excellent tight bowling, Alex 8, Max 5, Fred 2. Rémi benefitted from some friendly bowling by the spinner to score some good leg-side boundaries near the end, before he took one on the hip and was bowled next ball for 26. Justin 2 Allan 1. All out for 94 in 34 overs. Quite a good fightback, could have been worse! Poitiers batted first and started well, before Fred struck in his second over, this brought the dangerous Naeem to the crease, first ball 4, second ball Phil knocked over his middle stump. Wickets fell steadily, with Rémi, Leo, Ajmal, Andy and Jay all taking wickets. Final score 59 all out. Ajmal and Gary set about the bowling and scored 19 off the first over, we quickly raced towards the total, Ajmal was out with only a couple needed, Tom joined Gary at the crease and scored the winning run inside 5 overs. in many locations across south-west France. click on image to see the pdf. 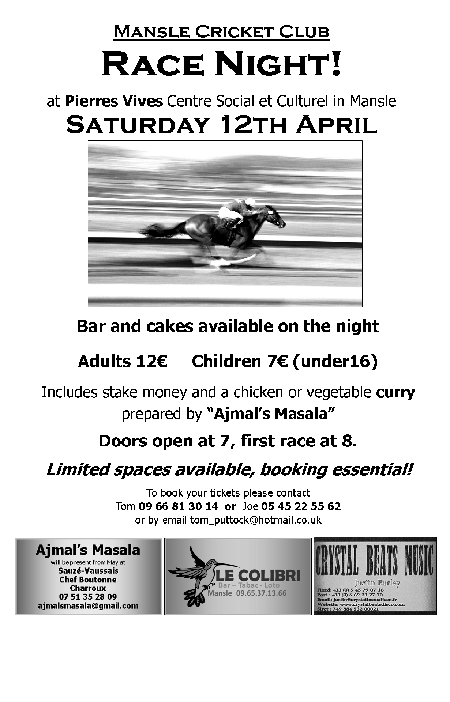 On Saturday the 12th of April we are organising an exciting evening of horse racing, including a delicious curry meal at half-time, at the Pierres Vives hall in Mansle. There will be prizes for the most successful betters, a bar and cakes available all evening, a great night out to remember! We lost the toss and were put in to bat, batted well with a sub total of 71, but minus 50 as we were out 10 times, leaving maille 22 to win. Although we got a wicket with the first ball of the innings we couldn't restrict them enough. Won the toss and bowled first, toock wickets at regular intervals giving us an easy total of 4 to beat. We batted more sensibly this time and won with some ease. Lost the toss again and were put in to bat, this time a sensible innings managing to score 36. 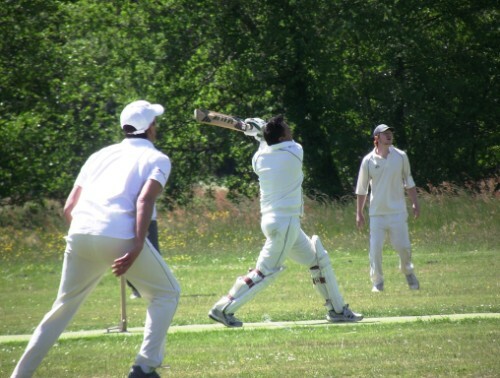 Maille were undone by a great bowling and fielding performance, with all the bowlers taking wickets. Lost the toss and were asked to bowl, we had a our groove by this stage and had a score of -1 to beat. We managed to bat well and ended with 41 and comfortable win. Everyone contributed with wickets for everyone, and everyone contributed with the bat also. 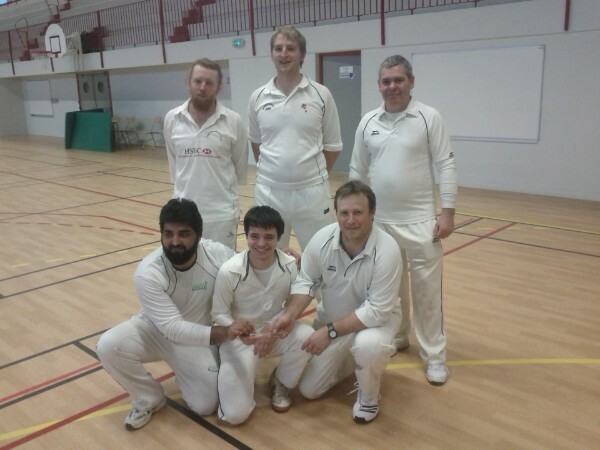 Well done Fred, Tom, Allan, Ajmal, James and Gary for bringing home our first trophyof the season. 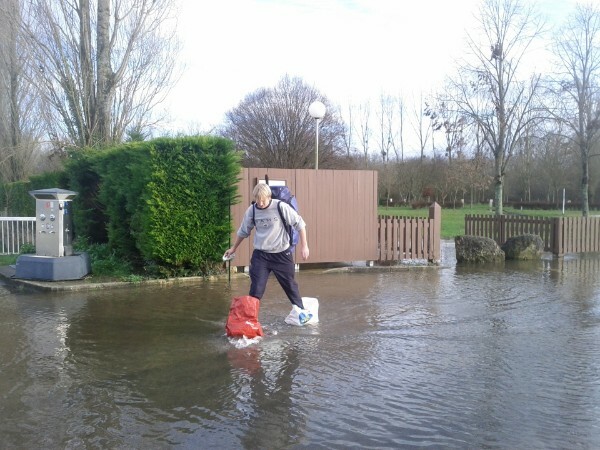 Flooding, what flooding, the Charente River might have been breaking its banks, but a small band of hardy (if not insane cricketers) were determined to have nets on the 02/02/14, great session, lots of laughs. Gary has applied for a patent for duel use shopping bags. Fixture list 2014 now available! Did you see the report of the Bordeaux game in the 'Avenir'? Thanks to Michel for his report and his photos! Sud Ouest have published an article about our club in their 6th of September issue. 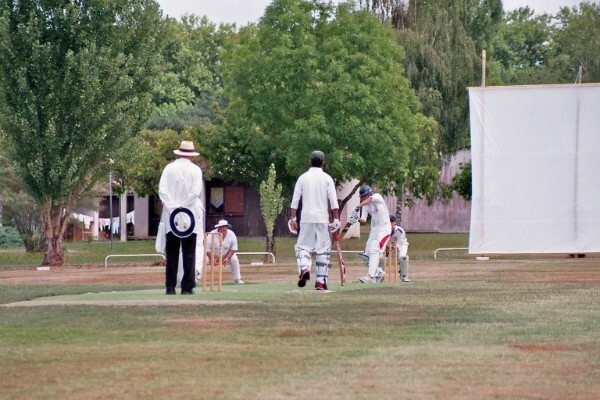 Natacha Thuillier and her photographer Céline Levain spent more than two hours before the Bordeaux cup game talking to players, and the result is a well-written and cheerful look at cricket in deepest France. Many thanks to them both, and to the players for their co-operation. You can see the article on the Sud Ouest site here, or by clicking on the photo, or download the PDF file here. 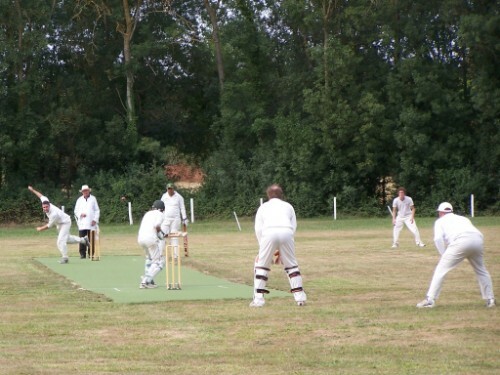 We played two Twenty20 games against Bordeaux Giscours at Mansle on Sunday 2nd September, but lost both by slim margins- 142/136 and 157/143. Top scorers for us...Shakhil (captain) 62, Kamran 45, Max 40. Well contested games, as always against the Girondins, but played in a good spirit. More photos on Facebook Thanks to Harry Mitton! 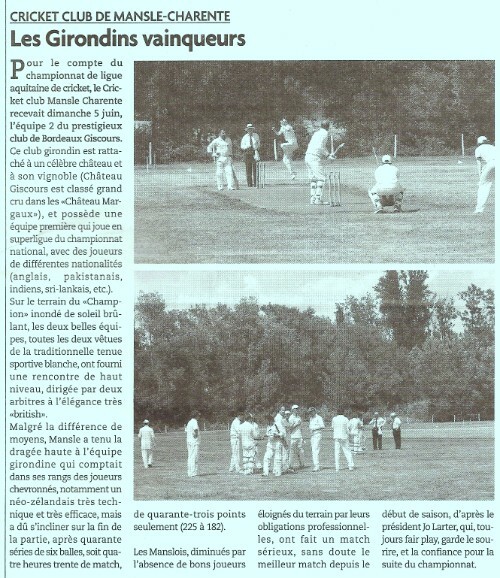 On two afternoons recently in Paizay-Naudoin and Salles de Villefagnan a total of about 30 youngsters were introduced to cricket. In spite of the rudimentary pitches, a great time was had by all, girls and boys from 6 to 13 years of age, using the Quik Cricket equipement. Thanks to Max and Alex for their energetic help! 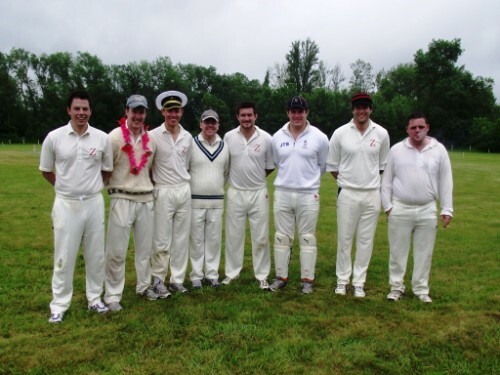 In spite of some showers, we played a double Twenty20 game against the Poitiers team. 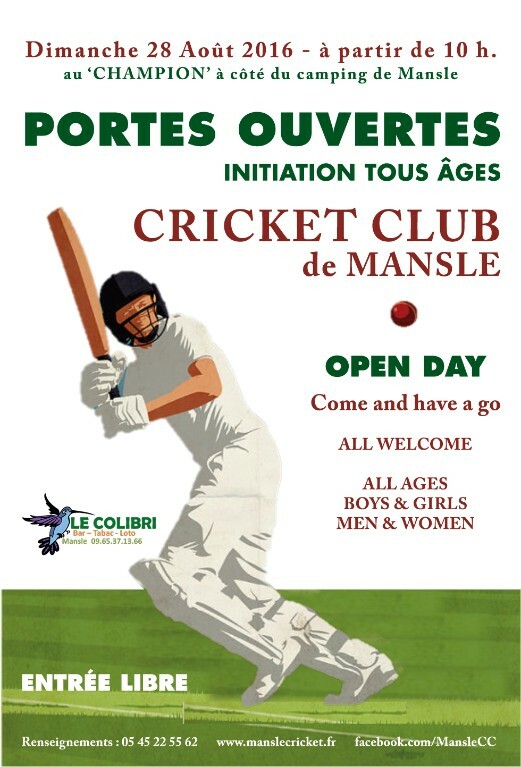 A very enjoyable afternoon's cricket saw a victory for Mansle in spite of some spirited work by the young ( and not so young ) players led by their impressive captain Oli. We hope to welcome them again in September, watch the 'calendrier' page. Thanks to Harry for the photos! New date for the match against Bordeaux in 2 x Twenty20 format- Sunday 2nd September. v St. Aulaye Sunday 1st July. 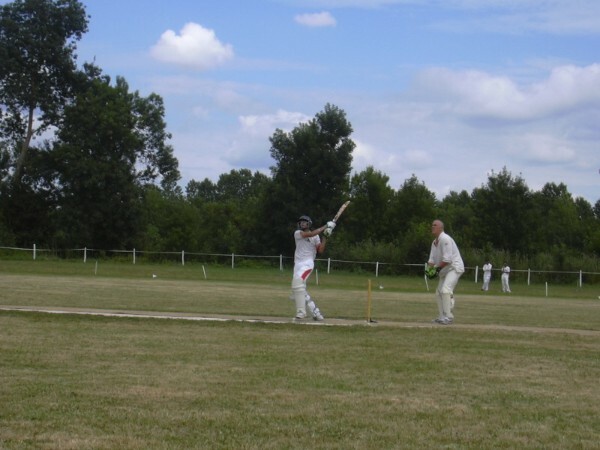 Another poor score of only 80 against the lively St. Aulaye team was never going to be enough. Some serious soul-searching needed by our batsmen! Fortunately that's the last league game this season! Still unable to score heavily we managed only 116 runs against a new young St. Aulaye team who easily knocked them off in 27 overs. 340km round-trip for yet another defeat in the league! The ground was soft and the ball wouldn't run so a low scoring game was in prospect. We won the toss and batted, making 96 from 31 overs. Difficult to defend such a low score, we nevertheless set about our task with energy and no little skill from our miserly bowlers, Hamza bowling 4 maidens, one wicket for three in one six over spell. Garry, Anis and Usman showed good discipline too. Eymet needed 35 of their 40 overs to reach the target. Our leaflets and posters are being distributed to businesses and tourist offices. You can download the poster here and the leaflet here. 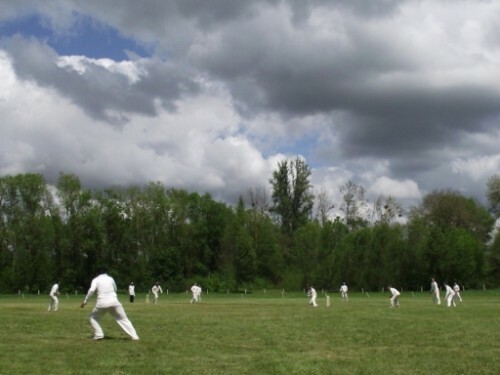 Friendly against Zenithians from Sussex, Sunday 20th May. We managed to play a T20 game aganst the visiting Zenithians in light rain and one or two dry spells, victory to the visitors by three runs! Well done to all who braved the elements, a very enjoyable game. We look forward to playing the excellent Zinithians again soon. At Bordeaux Giscours, 13th May. Always better to win the toss at Bordeaux (which we do usually...) otherwise they score 259 for 6 and then get you all out for 152! Some poor shot selection by some of our batters, and our bowlers have had better days, but an overall thumping from the experienced and talented Bordeaux team who will take some stopping in the league this year. 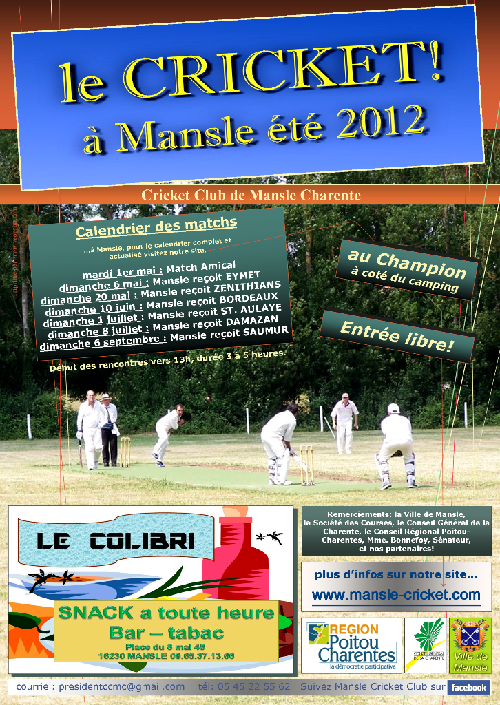 Return match at Mansle is on Sunday 10th June. Having kept the visitors Eymet ( 24 ) down to 114 we hoped to knock the runs off quickly...but a combination of poor shots and good bowling had us all-out for a mere 84, with Steve top scoring with 20. We'll have to be much better next Sunday at Bordeaux. Thanks to the players for their hard work getting the ground ready after the flooding. 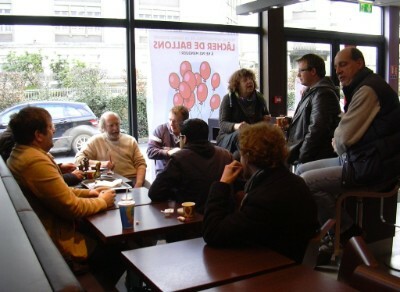 ...at the club's Assemblée Générale on Sunday 29th January at Angoulême. Congratulations to the winners, and thanks to all those who came! Open Day a big success, a group of ten boys and girls played a game in the morning, and the mums and dads joined in too in the afternoon. Thanks to the families, the players and other helpers for their good humoured participation. 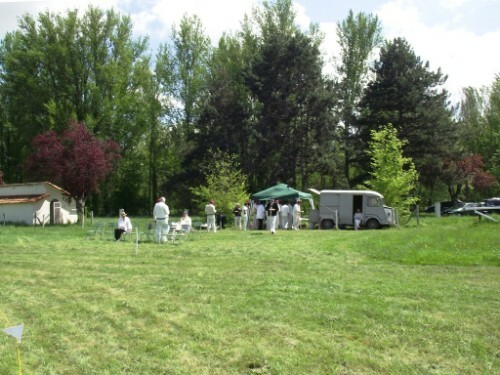 at our ground at 'The Champion' racecourse and campsite in Mansle 16230. All welcome, come and try cricket for youngsters in the morning and for the bigger ones in the afternoon, a match will be played with the club players and anyone who wants to have a go. All equipement is provided by us, and of course it's free! ICC in "it's just not cricket" shocker! You may have heard of the outrageous decision on Monday of the ICC and the "big" cricket nations to reduce the number of teams at the next World Cup in four years' time from 14 to 10. This will exclude Ireland- who had the temerity to beat England and score the fastest ever century at a WC - and other associate nations like the Netherlands or Afghanistan. ...the former West Indies star Phil Simmons, called Monday "a dark day for cricket but a great day for greed and fear", and labelled their exclusion "despicable". After 10 years of steady progress and improvement, leading to some remarkable results, the door is slammed in their faces. 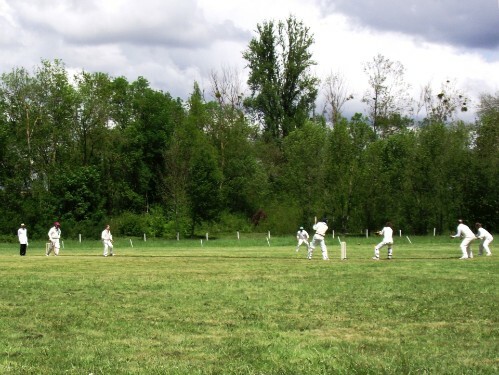 What of the future of cricket in France? Will we too be excluded from the club of the "big nations" if ever we manage to rise to their level and beat them? I encourage you to have a look here and sign the petition, which has already been signed by over 1000 people. 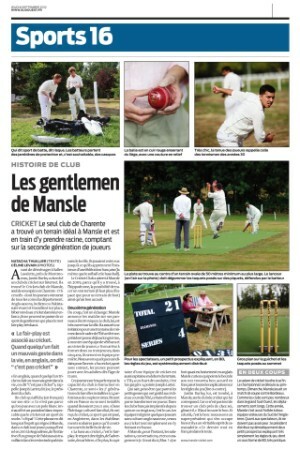 an article about the club is in the April edition of "the French Paper". 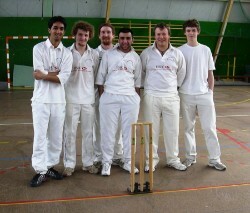 The club sent a young team to the indoor tournament at St.Astier on the 20th of March. The first match against the eventual winners - Eymet (24) - was very close. We lost by 3 runs! We then beat Treignac B but lost to the talented ( but technically unconventional ) Treignac A. Good performances from all the players, and captain for the day Garry! Catus 81 for 5 (7 points) lost to Treignac A 85 for 4 (18 points) by 1 wkt. 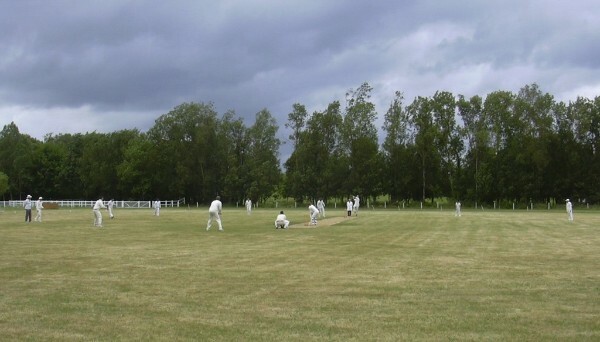 Treignac B 46 for 5 (5 points) lost to Mansle 47 for 4 (16 points) by 1 wkt. Mansle 32 for 5 lost to Treignac A 33 for 3 by 2 wkts. Saint Aulaye 24 for 5 lost to Eymet 27 for 3. At the recent Assemblée Générale of the club two trophies were presented to the outstanding players of last season. 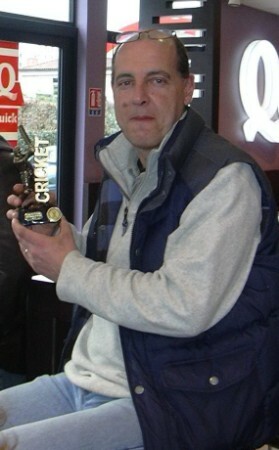 Batsman of the Year 2010 Arshad SHAH. 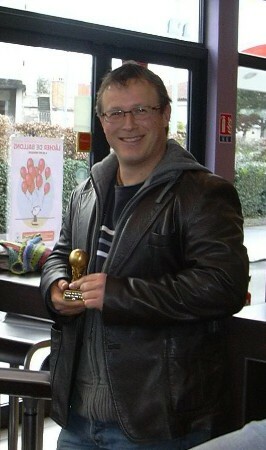 Player of the Year 2010 Max LARTER. Congratulations to both for their contribution. We count on you both to do as well in 2011! Statistics 2010 on the results page. On the 2nd and 3rd of October the club organised a training course for its players to obtain the Diplôme Fédérale 1 Initiateur de Cricket. For the practical sessions we needed some guinea-pigs and we soon found twelve willing youngsters. For half an hour on Saturday and an hour and a half on Sunday the kids gave their all during the exercises to learn the basic skills needed - bowling, catching, batting- followed by several short matches with rules adapted to indoor cricket. A great time was had by all! This group of talented boys and girls, and their parents, want us to do more sessions soon. 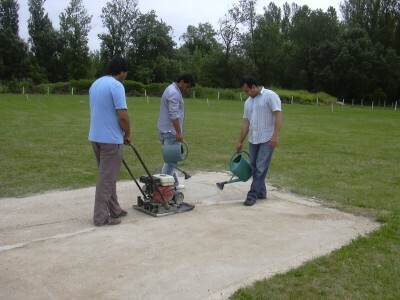 The course was run by David BORDES, trainer of the France national cricket team and Technical Director of France Cricket. 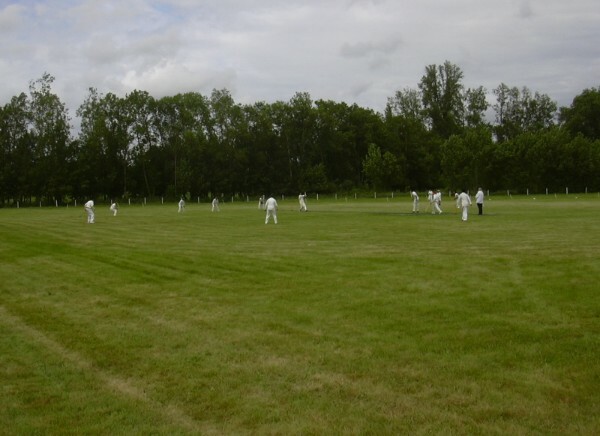 He was favourably impressed by the quality of the Mansle sports infrastructure and the talent of the Mansle Cricket Club players and their pupils. Thanks to the Tennis Club and their president Patrice LEFEVRE for letting us use their clubhouse. 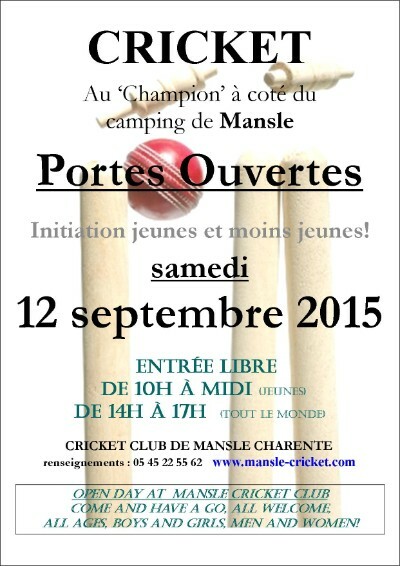 CC MANSLE CHARENTE 122 from 28 overs. NOE-GASCOGNE 124 for 1 from 17 overs. 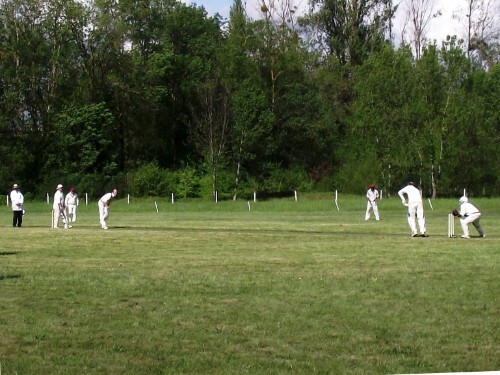 VICTOIRY for NOË by 9 wickets. 122 was never going to be enough with such a fast outfield and some fine aggressive hitting especially by Sriram (56*) and Abid (30*) saw Noë home in quick time. 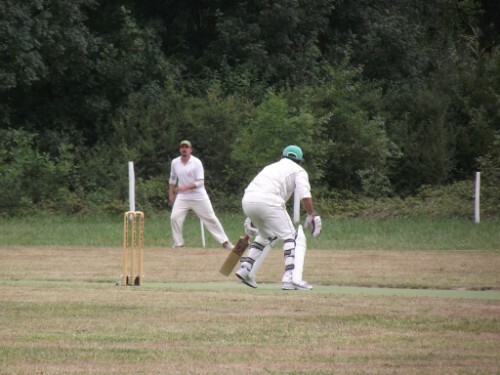 at Damazan, 15 august 2010, 35 overs. Mansle 143 pour 10 après 34 séries- Shakhil 34, Usman Mohammed 30, Larter.M. 20. Alcock 5 pour 24, Warren 4 pour 28. Mansle batted first but at 21 for 4 it looked difficult...but Max with his captain Shakhil and then Shani took the score to a (just about) defendable 143. 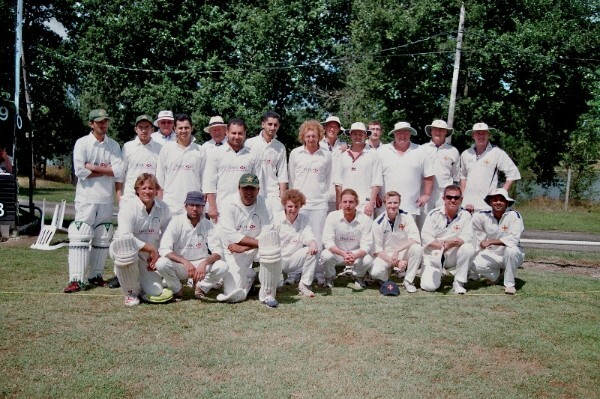 Having reduced Toulouse to 49 for 6 Mansle were scenting victory, but the Wardles held their nerve with Raja and captain Warren all making contributions, making the winning total with a few overs to spare. The two teams with the umpires before the game. Mansle crowned Champions of Pool C! First match on the new pitch...and the first win! Sunday's result puts us at the top of pool C ( Aquitaine ) of the National League. Good new pitch, good weather ( a bit too hot... 35°C ) and a great result! We will have a play-off game against the second-placed team from the other SW pool ( Midi ) Armagnac-Bigorre on the 8th of August at Eymet (24). The new pitch is ready! ...and the Societé des Courses de Mansle, of course. Mansle and Eymet with the umpires and Mme.Nicole BONNEFOY, Senateur, before the game on the 11th July 2010. Many thanks to the Mansle council works team for their precious help! ...stretched it and nailed it down. for it's setting, and now for the quality of it's pitch! 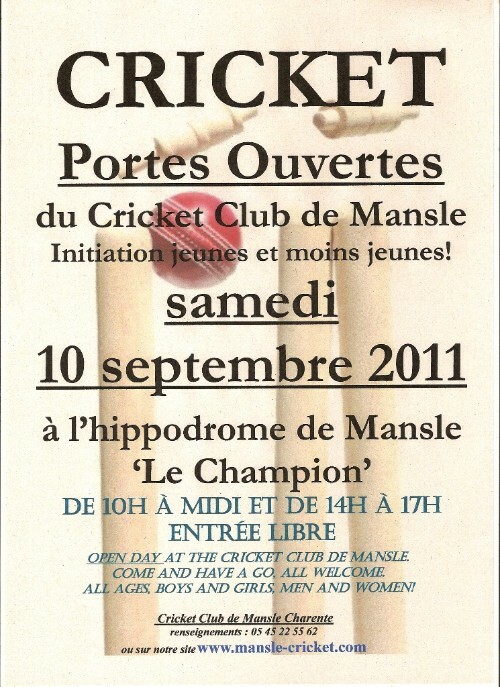 Mansle Cricket is now on Facebook and Twitter! of our matches and results. Click on these links to see our page on Facebook and Twitter. The club has changed it's name! thanks to the support of the Societé des Courses de Mansle and the Conseil Municipal de Mansle. The structure and personnel of the club remain unchanged. 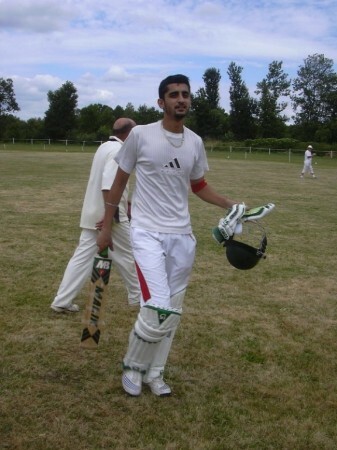 Usman scored 214 not out! 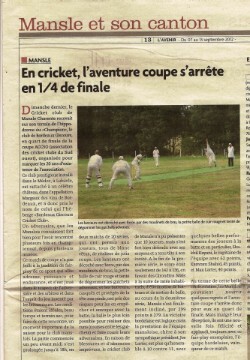 The best score ever in the SW league, or in league cricket in the whole of France! 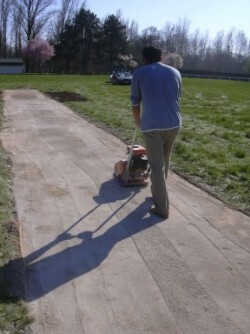 ...the first cricket ground in Charente! Come and watch our matches! St.Aulaye the 17th May 2009. Having spent 18 months visiting mairies all around Angoulême, and almost finding a site in three different communes, I finally struck lucky in a little town I know well, only 7km from my home. Mansle is a commune of 1500 souls in north Charente, 20km from Angoulême by fast dual carriageway, the N10. Pronounce it like 'Le Mans' but reversed...Mans Le! Mansle racecourse, known as 'Le Champion' (not to be confused with the supermarket of the same name...) , 500m perimeter, nestling in a curve of the Charente river, is only used for one or two meetings a year, and the council cuts lots of grass for no real purpose. Now they will be cutting it for cricket! 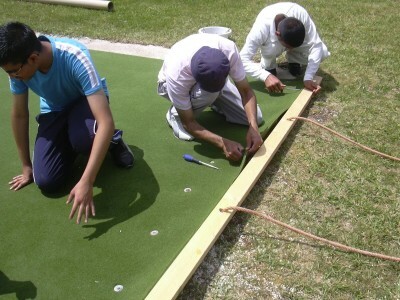 The council agreed to help with the work of installing a calcaire base and this was carried out this spring. 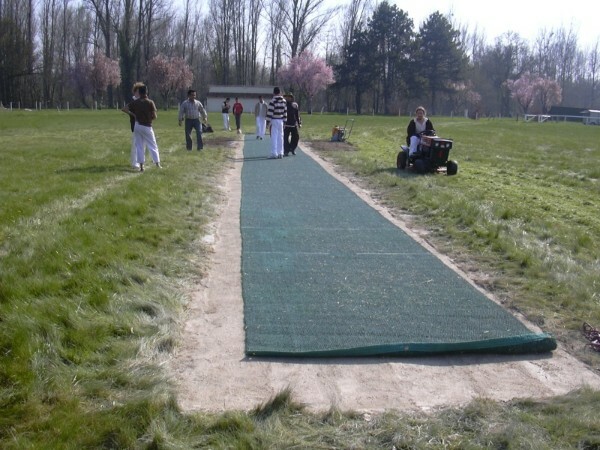 We will be using our coconut matting pitch for the near future. We have practiced on the surface and it works very well. Many thanks to John Ayling of Damazan for all his excellent advice. Whilst the setting is lovely, not everything is perfect yet. We are working to solve the problems we can foresee, and ask for your indulgence for the inevitable ones which will only become apparent over time, especially this first season. We are a small and young club, but I hope that now we have our own ground we can move forward quickly. 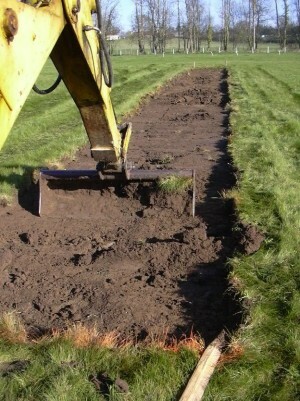 How to make a cricket pitch! 80kg vibrating plate while flooding the surface. We did it side-to-side first,and lengthwise afterwards. 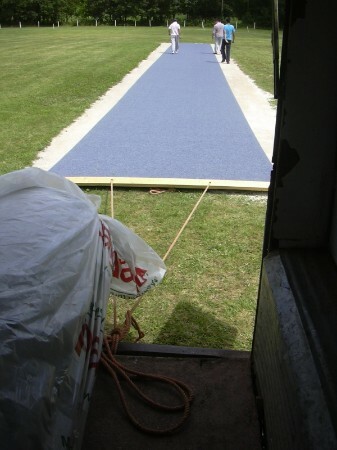 Roll out your coconut matting carpet and stretch it tight with the lawnmower. 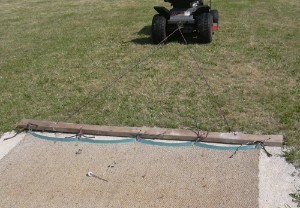 Tack one end down with 15cm nails with washers on and pull on the other end. Then stretch and tack sideways. 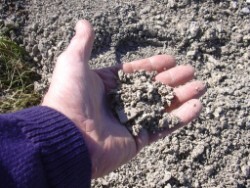 Although a bit soft at first, the limestone dries to near concrete-like hardness.